We see four technicolor little rainbows the camera didn't -you may find more! 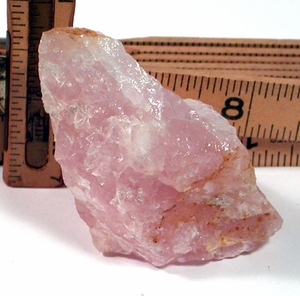 Shiny-bright, translucent and gemmy pink [the natural color jewelers dye for], it's a South Dakota rose quartz rough. Self displays several ways. Slight included and surface iron oxide complimenting the wonderful rosy glow - very fine! 1-1/2x 1-3/4x 2-3/4" standing [cabinet].